How wonderful it is to be woken on Nyepi morning and listen. The morning birds are chirping extra loudly today, perhaps it’s just that there’s no other sounds to drown them out. No distant hum of traffic. No motorbikes on the nearby village path. No chopping of the day’s ingredients in the restaurant below. No idle chatter of the local construction women who spend their day walking up and down carting baskets of sand and bricks on their heads. No other sound. Hang on, is that a plane I can hear? It must just be just passing through Balinese airspace, as none can land here today. Today is Nyepi. Balinese new year. Silent day. Once a year on a dark moon around March or April (the date changes according to the complicated Balinese calendar), is this special day. The belief is that if everyone is silent for the day, lights no lights, and burns no cooking fires; that the evil spirits will be led to believe that everyone has left Bali, that it’s not worth bothering with or disturbing for another year. It is a day for reflection and meditation. No one is allowed on the streets, and must remain in their family compound. Tourists are not exempt and must remain in their hotels. The only people outside are the Pecalang, the local religious neighbourhood watch; patrolling the villages to make sure everyone is following the rules. Of course emergency services are able to operate. But at the local birth centre I support, Bumi Sehat, they tell me that it’s also a quiet day for them. The local women usually cross their legs and hold off giving birth. Tomorrow, however, will be busy. Last night was the Ngrupuk parade. It was not so silent. In my village pots and pans were banged about and nearby Ogoh-Ogohs were carried through the streets with much revelry. Ogoh-Ogohs are huge paper machine and bamboo monsters made by the local men and boys in every banjar. It takes them weeks. It is quite a spectacular parade to watch. They are a recent, but popular tradition here. The the idea of this noise is to wake up those pesky evil spirits, so that they are all aware of the silence the next day. The day when no one is in Bail, wink wink. A group of partying Russian tourists in the hotel next door took the noisy part a little to much last night. I heard the locals ask them to be quiet several times. ”This is not Kuta, if you want to be noisy go there. This is Ubud, it’s quiet here.” I heard the threat. Unusual, Balinese don’t often complain publicly. Today they are quiet. I look forward to this day, and hope that my schedule has me in Bail for it. I love the undisturbed noisy silence. By evening it can be a little difficult to try and remember not to turn on the lights, or at least dim them and pull the curtains shut. A couple of years ago I had a knock on my door by one of the Pecalang. I had the light off, but my computer on. The glow of the screen could be seen from outside. You’re not supposed to work or partake in entertainment either. It depends how you define work and entertainment. For me writing is neither (well perhaps a little on the entertainment side). For me writing is reflection, which is what you are supposed to do today. Imagine if Nyepi were to catch on worldwide. It would be like ‘Earth Hour’ for 24 hours. Imaging the huge savings to our resources. No coal burning electricity. No petrol guzzling traffic. No traffic accidents. No crime. Nothing consumed. The economy would go into a spin. People would have to talk to each other (quietly). There would probably be a spike in the birthrate nine months later (there is in Bail too). In Bali it is a day to restore the balance of nature and of the spirit. Wouldn’t it be wonderful if that could be restored everywhere. Imagine what it would be like where you live. Imagine the wonderful silence. So I’ll spend my day in reflection. And gratitude that the demons will be tricked for another year. I’ll spend my day in glorious silence. It’s joyously deafening. A few very scary Ogoh-Ogoh, the stuff of nightmares. Ubud, Bail. Honey makes you funny. Well that’s what I always said as a kid. Never cared for the stuff. I know I’m grateful for the bees for pollenating our plants and all, but they can keep that sweet goo. I was always a Vegemite kid. I didn’t really like peanut butter either, too sweet; but a nice bitter marmalade, now you’re talking. When I first moved to Bali I tried to buy a toaster, a common and inexpensive household item in my homeland of Australia. Not so here. The only kind I could find were expensive industrial sized, aimed at the five star hotel market. My next trip to Jakarta I scoured the department stores and found an overpriced, but adequate one. It lasted two months before the inconsistent power surges blew it out. Again I tried – this time in Singapore, and found a cheap model similar to the ones I had used in Australia. If this one blew up, it wasn’t such a huge expense. I would try again. I still have that same toaster, and its still toasting as well as the day I bought it almost ten years ago. These days toasters can be bought in any supermarket here, it’s a different world now. Vegemite however, is still a luxury imported item, rarely available. And expensive. I usually wait until friends from Australia are coming to visit and request a care package. Interesting fun fact from Wikipedia – In 1984, a jar of Vegemite was the first product to be electronically scanned at a checkout in Australia. There’s some great small industries producing delicious marmalades here too now. Inevitable with the abundance of delicious fresh limes – they have me covered there. 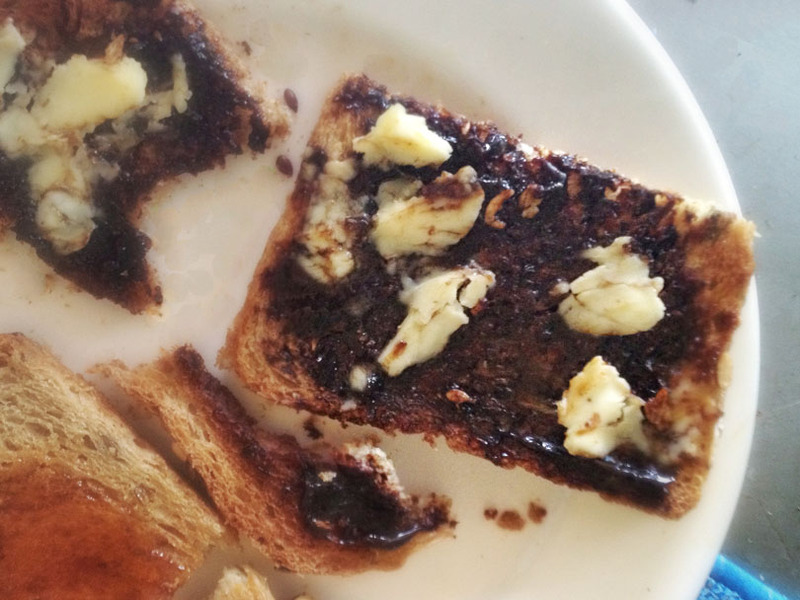 Vegemite on Toast, You’re doing it wrong! Butter isn’t something I ever used so much. I never thought it was necessary until a couple of years ago, my young niece made me scrambled eggs for breakfast. They. Were. Delicious. “The secret is butter, Aunty Sally” she told me. Mmmmm Butterrrr. The butter here is imported from New Zealand or France. I like the French brand, and these days sometimes even have it on my toast. With Vegemite. In Australia I always had a jar of honey in the fridge. Sometimes a recipe would call for it. A jar could last me five years. I tried the ‘gourmet’ honeys too – the ones where the bees feasted on stringybark trees or rare wildflowers, but none excited my taste buds. The honey in Indonesia is thin and runny. I don’t think it’s just because of the heat, as the imported brands remain the same sticky consistency. I have tried pure honey from the environmental centre we visit on our trips in East Java, but it still does nothing for me. That is until I recently discovered NEW ZEALAND HONEY. What is it with the bees over there? I know it’s a big industry and that Manuka honey is said to have all sorts of healing powers, and an expensive price tag to match the claims. I recently bought a jar of New Zealand beech forest honey. OH MY, it’s thick, treacley, caramely, malty and I can now understand the fuss. The jar lasted one month. I am halfway through a second. IT. IS. GOOD. I know there is a world campaign to save the bees, as many species are endangered. If there were no bees to pollinate our food we would soon grow hungry. A world without bees also means there’d be none of that delicious New Zealand Honey. A sad day that would be. Even the ants think it’s better. 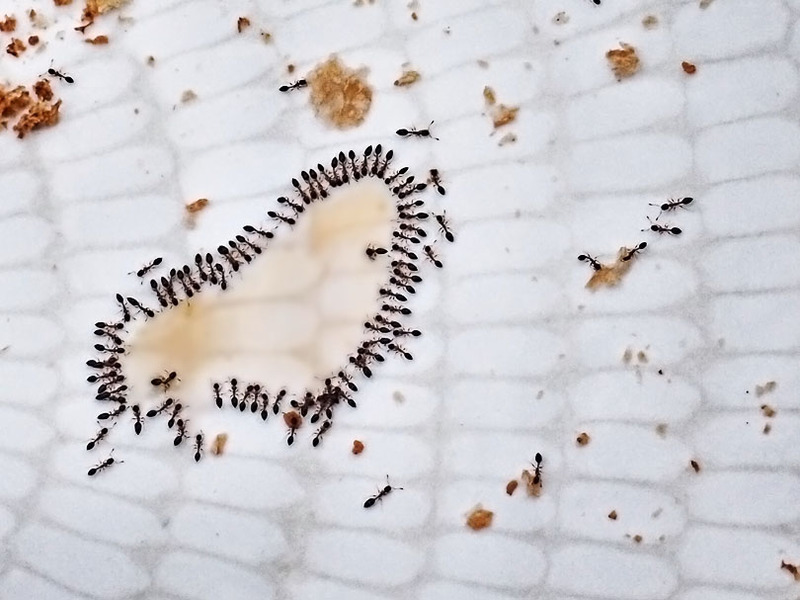 Ants love New Zealand honey so much, they make a heart! You know that photograph that you didn’t take, probably a time before smart phones? A time when every second of our lives wasn’t recored or shared. That time when you ran out of film. That time that you didn’t have your camera with you. That “Kodak moment”, as we used to say. Do you remember? I am lucky to have seen many wonderful things in my life so far, a whole reel of Kodak moments. For every memory I have recorded with photography, there have been countless times when I’d wish I had my camera with me. And times I was too busy enjoying the actual experience to think about photographing it. Floods destroyed most of our family photographs, so I don’t have many snapshots from my childhood. Consequently my childhood memories are mostly based on what I actually remember, not what was photographed. Although I do recall seeing some photos, so, perhaps it’s the memory of the photograph, not the memory of the event? In more recent years the reasons for the lack of captured images are usually due to the camera being out of reach. Or out of battery. Or me just not being quick enough. So I have began a list of “snapshots” that will not forever just remain memories. Instead, I can have my Kodak moments, at least as I remember them. Writing things down, like photography, makes my memories real. The ferry trip between Lombok and Bali is a long four hours, with nothing to see except sea. I was dozing in the stickiness. The sea breeze wasn’t reaching inside the smokey airless cabin. The vinyl seat was sticking. Some of the other passengers were asleep on hired mattresses surrounded by half eaten nasi bungkus (take away rice packets). A rumbling of voices woke me from my drowsiness. The ferry seemed to be tipping to one side. I looked up and it appeared that all the passengers had now woken and were leaning over the side of the boat. I jumped to join them. As far as the eye could see, on every wave, large and small; pods of dolphins were surfing and playing. There must have been hundreds, five or more to each wave. They jumped through the wake of the ferry, twisting and turning, floating and sliding. Performing like synchronised swimmers. They were having so much fun. I had never seen this many dolphins before (nor since). Film like. Magical. But it was real. I didn’t have my camera. I was preparing breakfast in my small kitchen in the ‘burbs of Ubud. 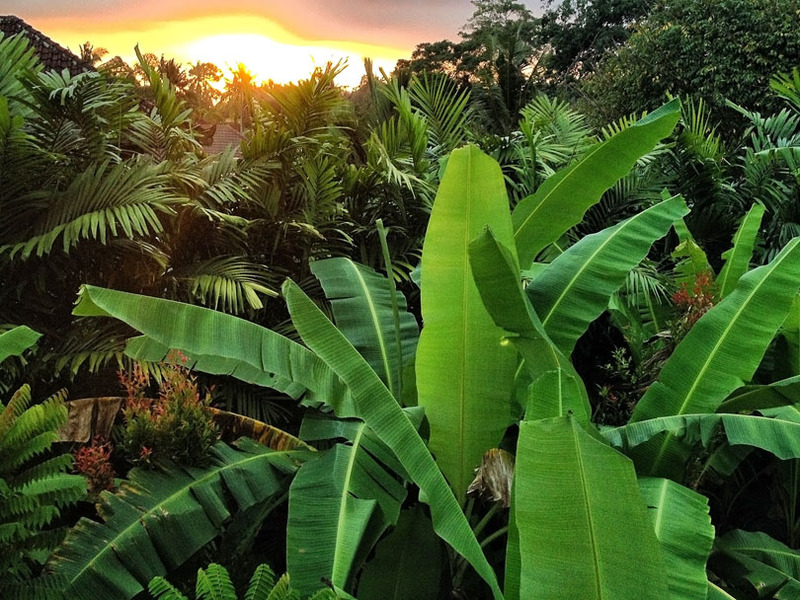 The dew clung to the leaves of the surrounding banana trees. The golden morning light flooded the room. Something caught my eye. A tupai – squirrel, or more correctly an Asian treeshrew, was jumping from leaf to leaf. I stopped to watch him. He then proceeded to perform his morning ablutions. Scooping up the dewdrops and washing his face and paws. His eye caught mine, but he continued with his bath. I ran to get my camera. In the moment I had gone he disappeared into the thickness of the foliage. I could have made a fortune on YouTube. Dam squirrel. Our tour in Borneo involved a couple of days camping in the jungle and staying with locals as part of a community tourism project run by MESCOT. 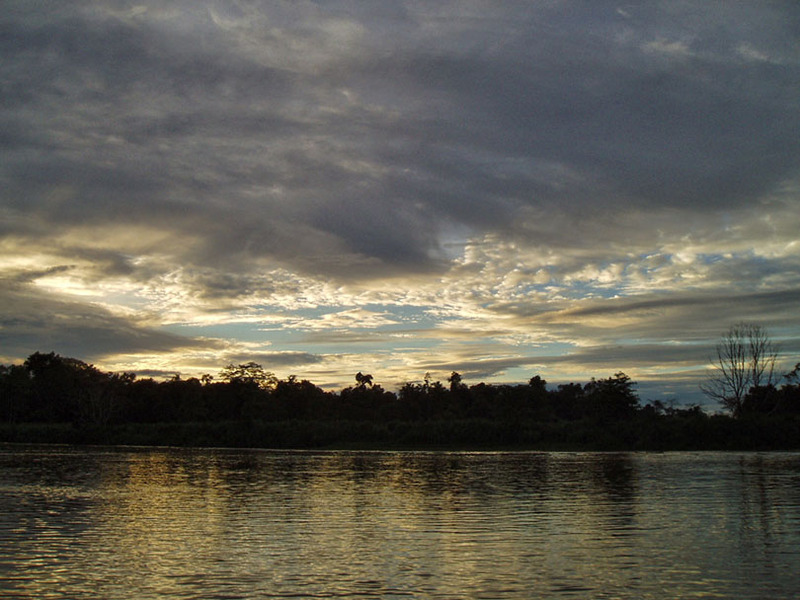 Our base near the Kinabatangan River, the longest in Sabah, is one of the most prolific areas to see wildlife. The day began with a pre breakfast boat ride. Mist rose in whisps from the water, as early light filtered through the monochrome trees. The first birds were starting into song. Cicadas buzzed. A melodic whistling gibbon’s call could be heard in the distance. It was still cool, the closeness if the day was not yet upon us. The wide brown river flowed calmly, but we all know still waters run deep. A log from the upriver industry floated past. The encroaching palm oil plantations creeped up on one side of the bank, the other side still thick native rainforest, protected for now. There was a movement in the mud flats. As we drew closer, two large mud-coloured monitor lizards embraced in a duel. They had both risen on their hind legs as their arms entangled. The weight of their meter long tails counterbalanced the huge bodies as they thrashed about in the mud, climbing upon each other. Muscles rippled, it was a well matched match. They became one large symmetrical monster as they clung upright, together. In this prehistoric wrestling match, all bets were off. As we floated past, I was too mesmerized by the scene to think of my camera. When I was a kid I really wanted to start a club, probably due to my literary diet of American comics. So, my brother, a friend, and I banded together and formed ‘The Collectors’ Club’ for want of a better name. We spent an afternoon building small wooden stools from pieces of scrap particleboard from my Dad’s workshop. I don’t recall why, but seating was an important prerequisite to joining our club. We decided our motto would be ‘Get More Stuff’ (every club has to have a motto, right?). We didn’t have a uniform, probably because we didn’t think of it at the time. I don’t know why, as I was rather obsessed with ‘The Sound of Music’, and really wished my entire family would dress in matching outfits. My Mother did attempt this once. Only once. The premise of our Collectors’ Club was to collect the little soaps, and miniature cereal packets that you get in hotels. Our club meetings involved a show and tell presentation of these sort-after items. My recollection is that we had only one meeting, and as we didn’t really stay in hotels that often, our club quickly disbanded. Coincidentally in my adult life I first became a packaging designer and sometimes designed those miniature packets. Later working in the travel industry, I spend most of my working life in hotels, and hey, guess what I have a collection of? Growing up, ‘Get More Stuff’ became the motto for my life. I was the kid with the messy room. I had one bed for me, and one for my stuff. But, something happened when I was about sixteen, I suddenly wanted everything organised and hidden. I had inherited two huge industrial pigeon hole shelving units, so set about labelling and sorting. All my stuff was now categorised and in its proper place. I was happy. Over my adult years I continued to accumulated more stuff. I have always lived in small apartments, but that hasn’t curbed my ways. I was secretly flattered when a friend’s child once remarked, “I love coming to your place, it’s like a cross between a library and museum.” I have a lot of stuff. Occasionally the stuff overflows onto my bed and covers the floors. I am the adult with the messy room. Nonetheless, you can still open any cupboard to reveal my inner organised soul – neatly stacked and arranged items. My clothes are colour coded, as are my books. Music is alphabetical. The labelling machine is my friend. When I first visited Bali, where I now live; my initial reaction was “This is no place for a minimalist”. The Balinese are into detail. Everything is decorated. Everything from carved doors to walls, to offerings. The ceremonies require often weeks of making elaborate decorations and ephemera. There are no wide open spaces. There are no simple minimalist local homes, well none I’ve visited anyway. Most people simply can’t afford to be minimalists, in the western design sense of the concept, but many are minimalistic in their general living, sometimes simply due to poverty. Some may only have one pot, one glass for each family member, and use banana leaves for plates and hands for eating. Embarrassingly, one of my local friends remarked one day when I was hanging out my washing that I had a lot of bras! She said most Balinese woman only have two – one to wear, and one to wash. The same often goes for other items of clothing, with the exception of elaborate temple clothes. But as soon as anyone acquires wealth, the money is spent on decorating – first the family temple, then intricate carving on any surface of their home they can. More often than not in the homes I’ve visited, there are piles of stuff everywhere. Its defiantly not a minimalist aesthetic. Yet the Balinese still manage to focus on what’s important. Family and community and the spirit world are very much the heart of local life. Sure, many aspire to the trappings of western culture. And occasionally some Balinese, usually women, feel trapped in a culture that requires them to make endless offerings and ceremonies, endless stuff. 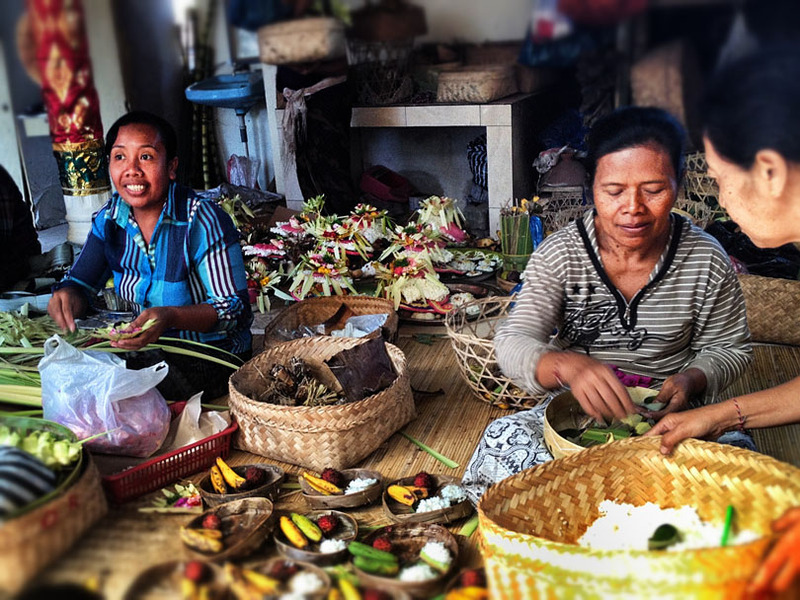 Balinese women preparing offerings for a ceremony. 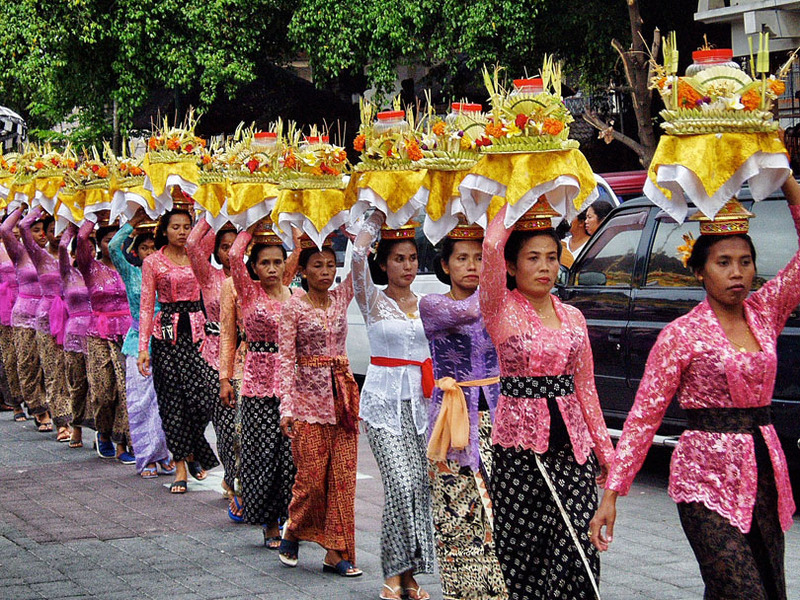 Balinese women on the way to the temple. Chronologically I’m a Baby Boomer (I only just make it, and more readily identify with Generation X), but perhaps it’s the Baby Boomer mentality, that can’t throw anything away. That would be wasteful. what if I needed it again someday? What if there was a war/flood/disaster/apocalypse? And so the accoutrements of my life continue to pile up around me. I love my stuff. But I do aspire to a least having it all neatly sorted. And labeled. When I look admiringly at my lovely well organised storage units, sometimes my eyes lift their gaze and focus on the excess paraphernalia stuffed on top yet to be sorted, and dream of the minimalist perfection of owning nothing. Frankly, I blame The Collectors’ Club and believe it was the beginning of my downfall. 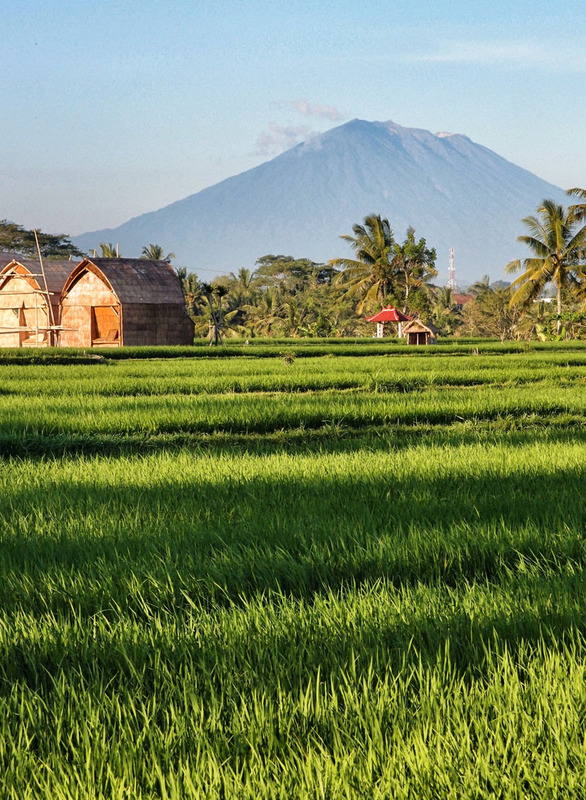 For the last ten years I’ve spent most of my non-working time in a small village near Ubud, Bali, Indonesia. There’s no public transport where I live, and a limited tourist bus system. Most locals rely on motorbikes, which are the ‘family car’ here – sometimes up to five balance precariously along with the shopping and the odd chicken. My main form of transport is my bicycle. On a recent evening I was going to visit a friend for a birthday dinner. She lives about 5km from me. I usually cycle, but as it was going to be dark on my way home, and it’s rainy season, and that she had promised to organise me a lift home; I decided to walk. The evening was clear, although there was the hint of an ominous looking rain cloud lurking in the distance. It was lovely time for a stroll in the warm twilight. As is the custom, everyone was out at this time of day. Farmers had returned from the fields, workers had arrived from their offices, kids were out enjoying the last light of the day. Not far from my house, near the river, was an old Ibu carrying a large basket of foliage on her head. “Mau ke Mana?” I enquired – literally “where are you going?”, but more often used as a polite greeting. “I’ve come from the garden, this is food for the pigs” she replied. “Cantik”, – “Beautiful”, she commented. I brushed off the compliment in the polite Indonesian way, “Oh, Ibu, thank you, but just average. You are beautiful too. All women are beautiful!” We both smiled and I bid her goodbye. Further along the path, the hubbub of a volleyball game was in progress. Every afternoon, in almost every village, groups of young men gather to play volleyball. A group of men on motorbikes had assembled to watch. There was cheering and shouting as the ball went flying out of bounds and one man climbed the fence to retrieve it. The ‘kaki limas’ – mobile food carts, we’re doing a brisk business. Steaming bakso, meatball soup, was being served up in chipped china bowls; the charcoaly aroma of sate sticks grilling on coals, a group gathering in anticipation. Everyone greeted me with “Hello”, as I passed. “Mau. Ke mana?” many enquired. “Jalan, Jalan”, just going for a walk, I replied. My answer met with a smile or a nod. The smell of ‘nangka’, jackfruit, wafted past. This rather large pungent fruit is a popular local treat, and grows along the roadside. A group of teenage girls called out, then giggled shyly when I replied in Indonesian. A small gang of young boys whizzed past on bikes way too big for them. I felt a drop of rain, but the sky still looked clear. Mums balancing babies on their hips, while feeding them rice porridge with their fingers, lingered by the gates. Another volley ball game was in progress… I’d moved on to the neighbouring village. This one had a larger audience, and the cheers, were more rowdy. Another spit of rain, and then another. Time to open the umbrella. As I opened my umbrella, so did the heavens, but this tropical burst was short lived. A tailless cat scampered by, avoiding a truck laden with lime green LPG canisters. A cyclist sped past, this time a young man in full lycra cycling gear complete with helmet, a sight that’s becoming more common on the roads here. Previously when I rode my bike around Bali, I was only old accompanied by toothless farmers or young kids on bikes. The light faded as I entered I the village where my friend lives. A couple of old men lounging in the security post at the entrance to the village welcomed me with a warm smile. I too had a grin on my face, and was soon at my destination. I then resolved to get out more; slow down, and take a stroll more often to remind myself why I love living in this delightfully warm and friendly little part of the planet.